Desiccated coconut is made from the flesh of fresh coconut that has been dried at low temperatures. Buy high quality Desiccated Coconut today, available in 100g, 250g, 500g or 1kg. Add To Cart below. Desiccated coconut is made from the flesh of fresh coconuts that grow on the coconut palm - a tropical and subtropical tree, which thrives in coastal regions and was referred to as "Kalpa Vriksha" in ancient Sanskrit (meaning "The tree that provides all the necessities of life”). Dried at low temperatures, desiccated coconut retains an optimal number of naturally occurring nutrients, including vitamins (B vitamins and vitamin C) and the minerals, magnesium, phosphorus, manganese and potassium, and boasts an irresistibly exotic and mildly sweet, coconut flavour. Desiccated coconut is a flexible kitchen ingredient that’s simply delicious in all manner of sweet and savoury dishes – it can be sprinkled generously over breakfast dishes, fruit salads and desserts, or used as an additional ingredient in raw chocolate, cakes and snacks, for example. And, as desiccated coconut absorbs a significant amount of water, it is an ideal natural thickening agent in your favourite smoothies, shakes and protein drinks. The coconut palm is an ancient plant and distant relative of the grass family that grows best in the saline soils of coastal regions. Whilst the exact origins of the coconut palm is unknown, it is believed to have come from the Philippines, where there are now more coconut trees than anywhere else in the world. Today, the coconut palm can be found growing between the latitudes of 26 degrees north and 26 degrees south, taking in the coastal regions of South and Central America, Africa, the southern coastal regions of Asia and the Polynesian and Hawaiian Islands. Has a exotic and mildly sweet coconut flavour. It absorbs a significant amount of water making it an ideal natural thickening agent. Contains B vitamins and vitamin C.
Contains the minerals, magnesium, phosphorus, manganese and potassium. Certified organic by "Organic Farmers & Growers". This desiccated coconut has been dried at low temperatures in order to retain an optimum number of naturally occurring nutrients. 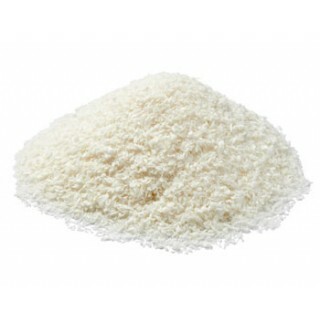 Desiccated coconut is suitable for those following a vegetarian, vegan or raw food diet. Or use as an additional ingredient in dessert dishes and smoothie recipes. These irresistibly exotic raw coconut macaroons - a deliciously sensible snack between meals that's bursting with fragrant coconut products and sweetened using raw honey. For lovers of good food and suitable for those following a vegetarian, vegan or rawfood diet. Preparing this tempting tropical treat is an absolute breeze – first gently melt the coconut oil and coconut butter. Next pop the desiccated coconut into a blender. Add in the melted coconut butter and coconut oil, as well as the raw honey, and process into a rich, sticky consistency. Now take a small amount of the mixture in the palm of your hand and roll carefully into a ball. Repeat this process for the remaining mixture. At this point you can get creative by sprinkling your raw coconut macaroons with a favourite topping, such as cacao powder or chopped nuts - the choice is yours! Finally place the macaroons into your freezer for approximately 1 hour or until nice and firm, before serving. Desiccated coconut is hypoallergenic and contains no gluten or other allergens. The coconut palm was named "Kalpa Vriksha" in ancient Sanskrit, which means "The tree that provides all the necessities of life”. There are more coconut trees in the Philippines per square metre than anywhere else in the world. 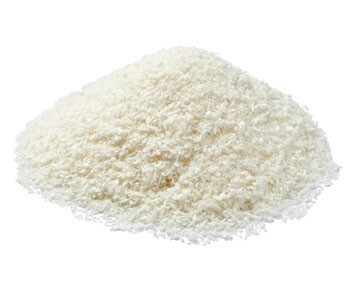 Desiccated coconut absorbs significant amounts of water, making it an ideal natural thickener. 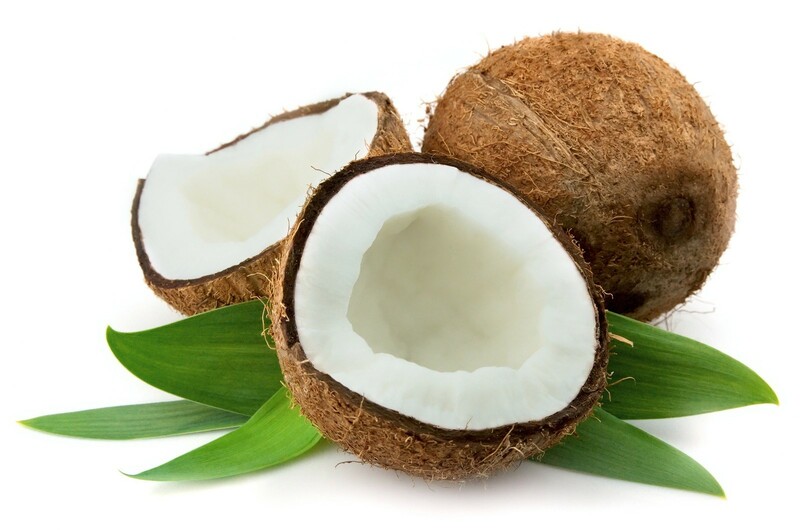 The coconut from which desiccated coconut is made is actually a drupe (a stone fruit) and not a nut at all. Do not order desiccated coconut if you have an allergy to coconut products. Always read the enclosed product information before deciding to eat desiccated coconut. Packaged in an area where nuts are processed. There are no known side effects associated with desiccated coconut. Women who are pregnant or breastfeeding are advised not to exceed the recommended daily dose.